Since past several decades, Dubai has been known as one of the best tourist destination not only in MENA region but also in the world. It is mainly due to efforts made by the emirate to transform this desert into one of the world’s most beautiful cities. Skyscrapers, beautiful parks, historical places, festivals, exhibitions are few such attractions available for tourists from different parts of world. Previously, most of the tourism in Dubai was recorded in winter season. But according to new strategy adopted by the government, several steps have been taken in order to attract visitors throughout the year. Several administrative measures have also been taken by Dubai and UAE that have resulted in increase in number of tourists in these places. It is the reason that number and percentage of tourists is continuously growing in Dubai since past several years. There is no doubt that tourists from all over the world are making contributions in growth of number of tourists in Dubai. But the largest part is played by visitors from India. 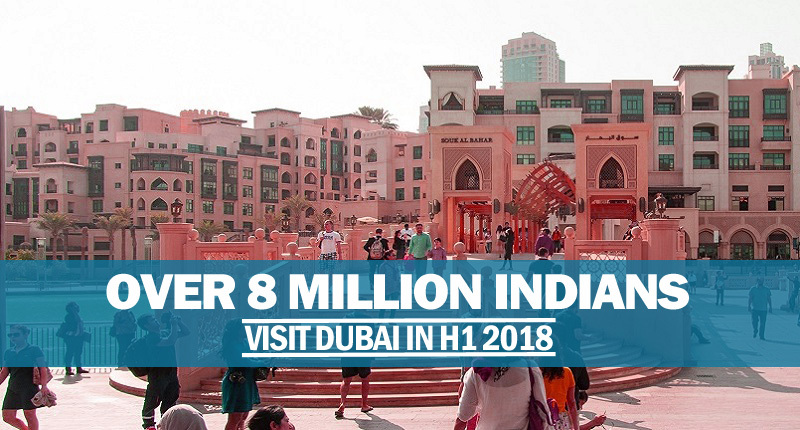 According to latest report, around 8.1 million tourists from India visited Dubai in H1 (January to June) of 2018. It is a record number of arrivals of Indian visitors in Dubai. Encouraging thing is that, the numbers of tourists in Dubai have always increased in H2 in last decade (since 2008). If this trend continues, then we can expect arrival of further more Indian tourists in next 6 months of 2018. Like tourists of other countries, most of Indian tourists arrive in the months of October and November every year because these are considered as start of festival season in Dubai. According to experts, the latest tourist attractions in this emirate are Dubai Parks & Resorts, Dubai Safari and Dubai Frame. Due to this reason, it is expected that large number of tourists from India and Middle Eastern countries will visit Dubai in H2 to view these new wonders. Dubai is in the process of achieving target of 20 million visitors in a year by 2020. For this purpose, the emirate is spending heavily on building new and beautiful structures, hosting festivals and events and marketing of beauty of the city. There is no doubt that tourists from India will play major role in assisting Dubai in accomplishment of its goal. It is the reason that Dubai is trying to attract more and more visitors from all parts of world especially India. If you are a tourist from India or any other part of world who wants to take advantage of the tourists’ attractions available in Dubai, then we at Riz & Mona Consultancy can assist you. We provide visa services in Dubai.